1. You Get to Watch a Ton of Disney Movies! Let’s be honest. You totally enjoy those hours of Disney classics that your kid is obsessed with watching over and over. Yeah, you get certain songs stuck in your head, but they are a lot more positive than real life worries, right?! I get to watch so many of my favorite movies from when I was a kid, and I love getting to see Lana enjoy them too! It’s the best of both worlds, and it makes my heart melt! 🙂 I also get to see fun, new movies that come out that I probably wouldn’t have watched on my own. Ashton and I watched Moana for the first time with Lana, and now we love it! We also got to take her to Disney on Ice earlier this year, which was amazing! I sang along the whole time! 2. You Get to Wear Matching Outfits! It is so fun to put together outfits with Lana! Most of the time I don’t even realize that we have outfits that go together. 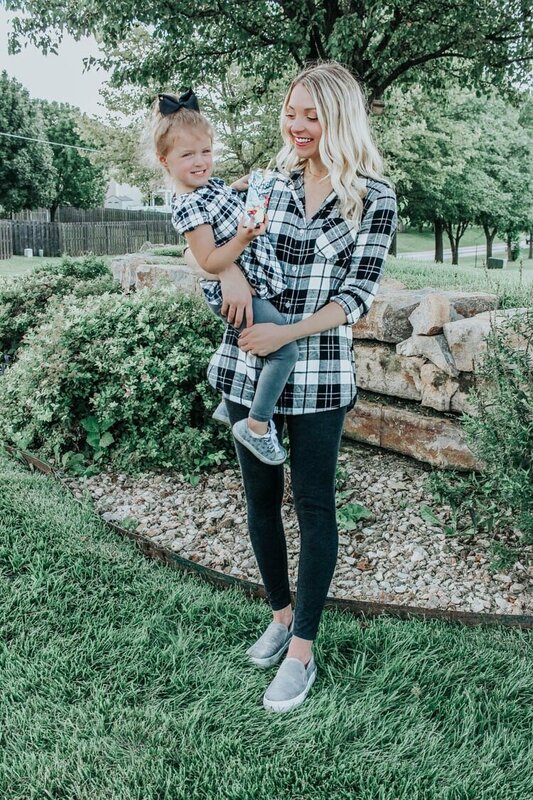 Then when I do, I love getting to go out and about matching with her! You can obviously tell who shops for her, because I keep finding things that I have bought for her that look just like things I own! 🙂 Even if you have a son, it can be fun to match certain elements of his outfit. You could also both wear plaid shirts like we do in the picture above! 3. You Get to Secretly Eat the Candy Stash from (Literally) Every Holiday! This one is SO true! I have gone to Target so much more now that I have Lana! That is saying a lot, because I always went to Target before she was born! It is really a Mom’s happy place! They have the dollar section at the front of the store, which always makes your kid(s) happy (and it’s also nicer to your wallet). Then you get to sneak on over to the clothing section and check out what’s new. After that, you need to make sure you are stocked up on all of your hygiene products over by the makeup section. 😉 There are just so many things you can accomplish at Target, even when you have your kid(s) with you! 5. You Get Constant Inspiration and Motivation Daily! Shop Our Outfits/Similar Items Below! I hope the 5 things I shared about Mom life brightened your day! 🙂 If you want to read some more of my posts about Mom Life, just click here! This entry was posted in Fashion, Lifestyle and tagged mom blogger, mom life, motherhood, parenthood.